Red 'Tricia' Dragonfruit is a vining, terrestrial fruiting cactus native to Central America, specifically Costa Rica and Nicaragua. It also goes by Pitaya Roja or Red-Fleshed Pitahaya. It has thick fleshy stems reaching from a few inches long to up to 20 feet. 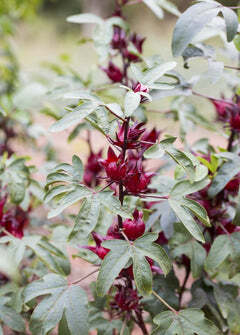 It produces cosmically cool, night-blooming flowers and sweet succulent pitahaya fruit. The fruit has red skin and sweet, deep red flesh with many soft seeds. Harvest Season: Spring, Summer; fruit forms 30-50 days after flowering. Soil & Moisture: Plants thrive in loose, sandy, well-draining soils, humate rich. Water only when soil dries out completely. Keep climbing poles moist.